Do you feel busy? A lot? I do too. So do the Mays. Erin and Collin pour their heart into helping patients all day, and come home to make dinner, do bath time, read a few bedtime stories, and maybe squeeze in a few minutes for themselves before powering down for the day. Our sessions are the time they put aside, often during the week, to turn off their technology and focus intensely on one another. All parents crave connection with their children, but with constantly growing to-do list sitting quietly in our pocket, setting the time aside for each other becomes more and more elusive. I love that as a photographer, I can provide my clients with this oasis from the everyday. Erin and I spent quite a bit of time talking about her children before our shoot. 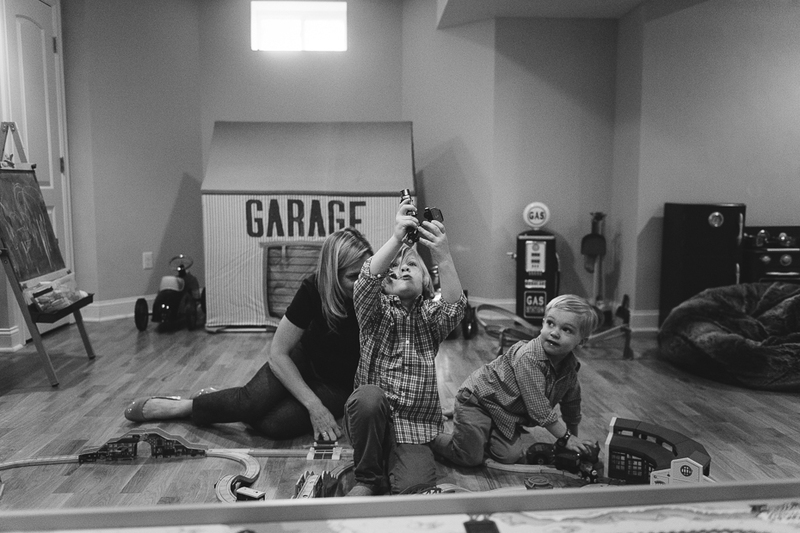 But we didn’t talk about the boys’ favorite toys – I asked her to tell me about the most joyful moments for her every day as a mom, and the times when her and Collin feel proudest as parents. 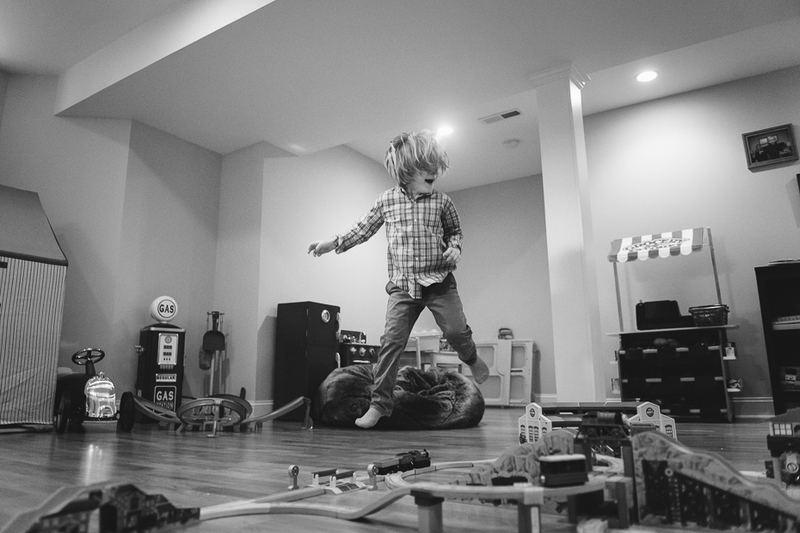 This allowed me to create photographs that go deeper than pretty pictures – it allowed me to create a permanent record of the things she misses most when she’s at work all day. And our session gave her family the space to reconnect in all the most important ways. This is the kind of experience all families deserve to have. It’s the kind of experience YOU deserve to have. Scroll down to find out how Erin answered my questions and the images that became the wall gallery we carefully designed for their home. The highlight of my week was installing the artwork and watching her smile grow as these images became a permanent reminder of their deep family connection. When I asked Erin about her favorite moments of the day, she told me that when she comes home each night, her almost 3 year old, Hunter, races into her arms and buries his face in her lap. 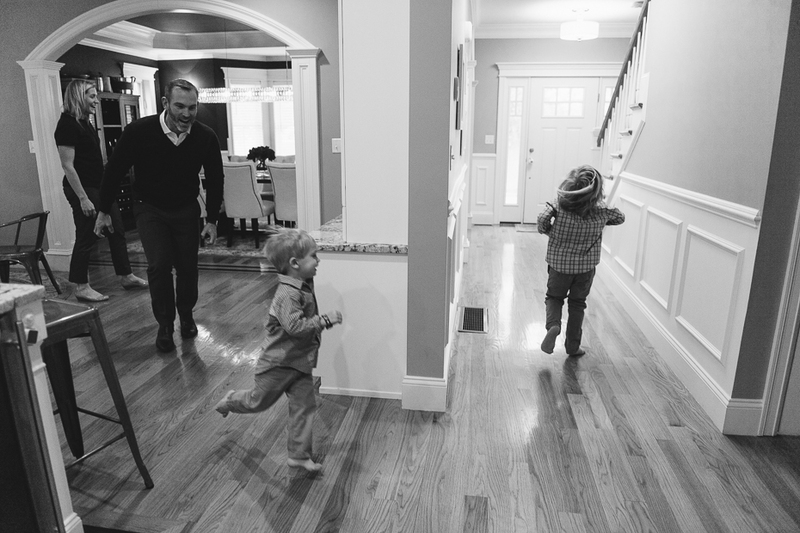 I love this image because he’s running to her with such conviction (away from the big bad daddy monster :)). Erin feels proudest as a parent during these moments of reading with her five year old son, Jackson, each night. We owe so much to our parents, and this image will be an awesome reminder for Jackson in a few years of how much effort his parents made to create the brightest future possible for him. This is one of my favorite images of the day because it’s so honestly depicts life with two boys. Love and chaos. This is their home gallery. We designed it together in about 20 minutes. The images are mounted on bamboo and were installed as a complimentary part of her service. Karen is an award-winning photographer specializing in documenting and preserving family history. She would love to get to know YOU! You can see more of her work online at www.kkpforlife.com, on Instagram or on Facebook. If you’d like to contact her directly, you can find her at karen@kkpforlife.com or you can send her a note below.